Over the years, many backlink checking tools have come and gone. They left us with stronger link profiles, a greater understanding of our competitors, and other advantages. But most importantly, they have left us with the question – what is the best backlink checking tool today in 2017? We decided to review some of the top SEO tools that are widely used by our own team and other SEO agencies. The approach we took was very simple: see how many backlinks each tool picked up that pointed back to our own website and how many of those links were actually live. In theory, the data uncovered would prove which tool is most effective at showing us the most accurate number of backlinks leading to our site. Moz’s Open Site Explorer is perhaps one of the oldest and most widely used tools for checking backlinks. It is a powerful tool capable of identifying both bad and good backlinks for your own site. Its capabilities don’t stop there — you can use it to research competitors’ sites, too. Open Site Explorer has crawled 1 trillion links and has over 169 billion URLs in its index. Moz is constantly updating OSE with monthly index revisions or other fixes to provide users with the most up to the minute changes. Ahrefs joined the backlink checking world in 2011, and it has received critical acclaim from many SEO experts and agencies for its large and accurate link index. Although its branding is mostly targeted toward researching competitors, make no mistake — for many SEO agencies, Ahrefs is a must-have for building out their own backlinks. Ahrefs has crawled 2.13 trillion external backlinks, boasting the largest link index out of all the tools mentioned in this post. It updates daily, and it refreshes every 15 minutes to ensure a thorough link index to check your site against. An established brand in the backlink world, Majestic has been around since 2004 and has consistently been praised as one of the world leaders in backlink checking for SEO. Majestic is also responsible for adding the terms “trust flow” and “citation flow” to our everyday lexicon of need-to-know SEO metrics. Majestic has two separate indexes: its Fresh Index and its Historic Index. Majestic’s Fresh Index is updated daily and contains data from the last 90 days, touting over 364 billion unique URLs crawled. Even more impressively, Majestic’s Historic Index contains all their data ever collected, which stands at over 1.2 trillion unique URLs crawled! Those numbers are certainly nothing to dismiss — combined with its veteran status, Majestic is a go-to source for all things link-related. In May 2016, SEMrush launched its own backlink checker/ analyzer/ crawler, adding yet another tool to be widely used by SEO professionals. 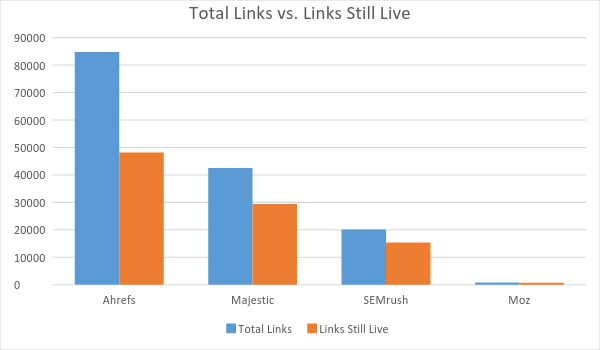 No information is publicly available about the size of SEMrush’s link index — however, it appears to be comparable to Moz’s. How many backlinks did Moz pick up? Out of all the tools, Moz picked up the least amount of linking domains pointing back to our home page. We even downloaded an advanced report from Open Site Explorer to see all the links pointing to our root domain (SEO Inc.), and found that Moz only returned 970 links. The small silver lining is that of those links, 83.55% were still live. How many backlinks did Ahrefs pick up? Ahrefs picked up the largest number of backlinks, with the number of referring domains slightly lower than Majestic. Pulling from Ahref’s Fresh Index, roughly 57% of the links were still live. How many backlinks did Majestic pick up? Majestic picked up fewer external backlinks than Ahrefs, but picked up more referring domains overall. After crawling the links Majestic was able to supply, about 29,378 or 69.11% of the links were actually still live. It’s important to give credit to Majestic for finding more referring domains than Ahrefs did. Having more links coming from more domains leads to higher trust, as it suggests more sites are finding authoritative answers from your site. It’s better than having lots of links coming from only a few domains, which Google may interpret as a blogging network. Just a thought. How many backlinks did SEMrush pick up? SEMrush picked up fewer backlinks overall (compared to the numbers reported Moz’s dashboard), however, they picked up more referring domains. Crawling the links downloaded from SEMrush, about 15,402 (78.22%) of the links were live. What is the Best Backlink Checking Tool of 2017? Based on the results from our tests, out of the four tools examined Ahrefs proved to be the most effective and thorough link checking tool. With 60,000 backlinks found and 1.3 thousand referring domains, Ahrefs proves its all-star status is supported by strong data. With 43 thousand backlinks and 1,600 referring domains, Majestic comes in at a close second. At third, SEMrush has come a long way since the inception of its backlink checking tool, but still needs improvement in offering a backlink checking tool to match the power of its other features. Moz OSE was the least accurate of all the tools examined for our purposes, picking up the least number of total backlinks. It’s a common practice for many SEO experts to use more than one backlink checking tool simply because each have such varying indexes and interesting quirks to them. And if you really want the best idea of where your site stands compared to your competitors’ sites, you should consider looking at the entire package. For example, although Majestic came in second for our testing purposes, it has a tendency to put too much importance on trust, and there are plenty of low quality, high trust sites out there. Another example is that although Ahrefs is our gold standard for backlinks, many are finding that SEMrush suits their needs best for keywords. If you were on a limited budget, you’d want tools that could offer you the most bang for your buck, and for that SEMrush would look like an appealing option — but that’s a topic for another blog post. In summary, Ahrefs should be your go-to tool for backlink checking. But if you’re serious about gleaning the most knowledge from your site, you won’t ignore the other tools either. Any of them can give you an edge over in-the-dark SEO, so do the smart thing and choose the one that’s right for you. Are Bing Ads Finally Hitting Their Stride? I am missing the linkresearchtools. Is there any reason you guys did not consider the LRT? Thank you for sharing this information. We have been using Majestic for a few years and it has worked well for us. We will definitely look into Ahrefs after reading your review to expand our reach. Do you have any favorite link analysis tools to determine link toxicity? We use Link Research Tools for link detox, although there are plenty of other great tools out there to look into. SEMrush also has a backlink audit tool that is in beta, but there is a lot of room for improvement. Rather than which give the most results I feel the question should be “which is the most accurate?”. Having a higher number of results does not mean the most accurate, in fact it could mean that the higher number is the least accurate. As it is rather hard to test 20-30k back links one is putting a lot of trust in these tools and, as they give differing results, it is hard to imagine trusting any one of them fully. You’re absolutely correct and you should never look at a single data source – that is why we examined the actual number of live links vs. total links that were pulled from each tool at the end of the article. Good Article John….my client was asking about domain rating after reading an ahref article. I currently have an account with you at awrcloud….do you have any statistics / graphs / etc that are related to backlink quality and quantity in the awr package…if not why not as I prefer one stop shopping for SEO analysis and trending? AWR Cloud does not provide charts or reports on backlinks, and I’m afraid that our plans for the next period don’t include such reports either. I’m sorry if this is inconvenient for you. Our aim is to provide the best rank tracking service possible, rather than taking in and expanding on additional services.